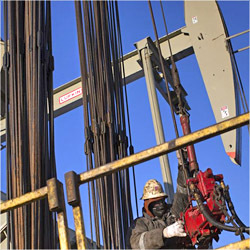 HOUSTON (CN) – Oil prices crept up to over $50 per barrel Wednesday after OPEC and Russia agreed to cut production by 1.2 million barrels a day starting in January. The Organization of the Petroleum Exporting Countries’ deal reached in Vienna on Wednesday is its first agreement to cut production since 2008. Saudi Arabia, the 14-nation cartel’s top producer, will bear the brunt of reductions, cutting 486,000 barrels a day. The deal sent oil futures traders into a tizzy as they look to capitalize on the price uptick by locking in contracts to sell crude in the early months of 2017. March 2017 Brent crude futures traded 783 million barrels on Wednesday, worth $39 billion, breaking a record of 600 million barrels set in September, according to Reuters. Brent is the international benchmark for crude oil prices. It was trading at $52.48 a barrel Thursday morning, up from an 11-year low of around $28 a barrel in January. But analysts had a tepid response to OPEC’s deal because the 1.2 million barrel production cut is less than 2 percent of the average worldwide production of 96 million barrels per day, and U.S. shale producers could ramp up drilling, adding to an already oversaturated market. Crude prices are down from a recent high of $114 in June 2014 due to a glut caused by U.S. production reaching record levels in 2015 as fracking technology let drillers tap oil in shale, coupled with Saudi Arabia’s refusal to cut production to maintain its market share and put small U.S. drillers out of business. The Saudi strategy worked: 105 North American oil and gas producers have filed for bankruptcy since January 2015, according to an Oct. 19 report from the Haynes and Boone law firm, which tracks energy company bankruptcies. But Iran, an OPEC member and Saudi rival, undercut Saudi efforts by ramping up its production, which has reached 3.7 million barrels per day, after the United States and other nations lifted trade sanctions in January as part of Iran’s deal to let the international community monitor its nuclear program. Saudi Arabia now competes with Iran to sell oil to energy-hungry India and China, the world’s most populous countries, where improving standards of living are increasing demand for hydrocarbons, according to The New York Times. Despite the uncertainty of the impact the OPEC deal will have on oil prices, experts say it will likely benefit the oil-dependent economies of Nigeria and Venezuela. The oil bust has cost more than 250,000 oil field workers their jobs, according to University of Houston energy economist Ed Hirs.